Several journalists and news outlets from Croatia and Bosnia and Herzegovina faced death threats and intimidation following their coverage a war crimes trial at the UN International Criminal Tribunal for the former Yugoslavia (ICTY) in The Hague, Netherlands. In the ruling ending the case, six Bosnian Croat leaders were sentenced on several charges for an ethnic cleansing campaign against Muslim Bosniaks during the 1992-95 Bosnian war. What was supposed to be an easy task, writing a news report from a trial, turned out to be a quite delicate situation. The problem stems from how reporters should refer to the convicted men. War criminals or heroes? For the conservative and right-wing politicians, currently in power in Croatia, the case is clear. The defendants are heroes, regardless of what court has said. Therefore, Praljak and the other five defendants, in line with the nationalistic narrative, should be praised as heroes, while his suicide is seen as a highly moral act. In line with this, the majority of politicians in the Croatian Parliament held a minute’s silence honouring Praljak. Even the Croatian prime minister, Andrej Plenković, said that the UN court’s verdict was a “deep moral injustice” becoming, as the Guardian reported, the first head of an EU government in support of a convicted war criminal. Later, following the national and international critics, Plenković back-pedalled in his narrative, even though keeping “but” in his argumentation. In this kind of fraught environment the professional media were supposed to objectively inform the public. For those media workers that used “war criminal” to describe Praljak and other five defendants, what followed was a nightmare. 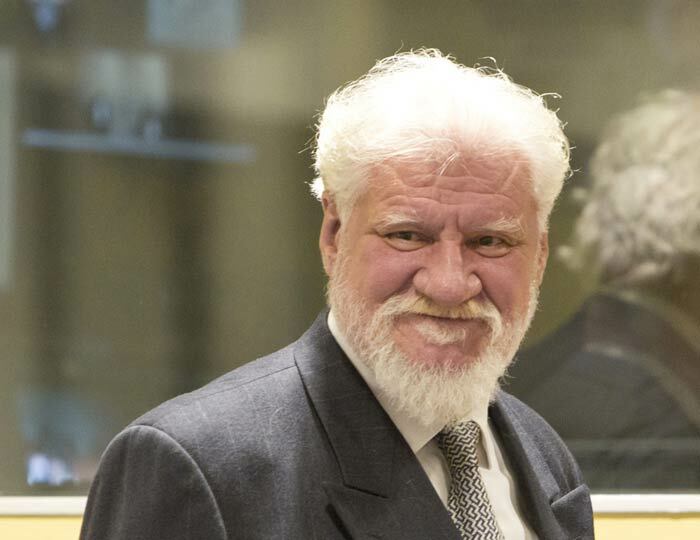 A series of death threats, intimidations, insults and bullying, mainly via social media, were issued against all those outlets and journalists who described Praljak as a sentenced war criminal, or were critically analysing Croatia’s involvement in the 1992-95 Bosnian war. Nataša Božić Šarić, editor and host of a political talk show Točka na tjedan (Point for the Week), which is aired on regional private broadcaster N1, received death threats and insults on Facebook after the show. Her question to the guests “should the sentenced be stripped of awarded medals?” was considered as provocation by conservative and right-wing viewers. The most recent report from the Croatian Journalists’ Association (HND) says that the latest in the long line of intimidated journalists is daily Jutarnji list op-ed Jurica Pavičić. He was threaten for his critical column on the Croatian Parliament’s decision to hold a minute’s silence for the defendants. The Praljak case resulted in similar rhetoric and threats in neighbouring Bosnia and Herzegovina, where the war crimes were committed. Sanel Kajan, a journalist and correspondent for the regional private broadcaster Al Jazeera Balkans (AJB), received threats from his fellow citizens, Bosnian Croats, for using his voice for the announcement of a special show on the ICTY trial on AJB and for sharing colleagues’ pieces on Facebook. “I received a ton of threatening messages via Facebook,” Kajan told Index on Censorship. “At the beginning I was just deleting them, but once I realized the gravity, as threats were multiplying every minute, I decided to report the case to the police,” he said. Among the numerous Facebook messages there were death threats like “You won’t be alive for a long time. I promise you this”; and a religious-based ones like “Shame on you, you unbaptised Satan”. This is not the first time these kind of threats have been “provoked” by objective reporting while nationalistic reports have been praised as true, patriotic journalism. Similar incidents have happened in all post-conflict Balkan states. In recent years, Mapping Media Freedom has documented similar cases in Croatia, Bosnia and Herzegovina, Serbia, Kosovo and the Republic of Macedonia. In all those cases media workers were threatened, intimidated and bullied for questioning nationalistic dogmas. Zdenko Duka, a well-respected Croatian journalist and former president of HND pointed out that there is plurality in the society which is backed by professional and critical media. “But unfortunately the ruling elite is pushing towards nationalistic rhetoric as a compensation for their incompetence and cowardness,” Duka said. Elaborating on the power dynamics he said that “the Catholic Church and the war veterans” are influencing Croatian politics through the ruling conservative Croatian Democratic Union (HDZ). “Veterans are a privileged group with 2-3 times higher average pensions than the rest of the citizens,” Duka explained. Croatia’s public and politicians have applied doubles standards to the ICTY verdicts: The court is praised when others are found guilty, but denounced as corrupt when it convicts “heroes”. For years this line of argument has been validated in the public discourse. Srdjan Puhalo, a political analyst from Bosnia and Herzegovina, calls this phenomenon the “moral incompleteness” of the Balkan societies. “Nowadays is hard to critically analyse the 90s wars. If you write critically you will be called a traitor, and everybody knows what one should do with traitors. Bottom line is that it is you against the system which is backing up the 90s ‘heroes’,” Puhalo said. The only exit out of this vicious circle, according to him, is time. “At the end, only the verdicts will stay throughout history and everything else will be forgotten,” Puhalo concludes. It is even more important that these kinds of threats against press freedom are not minimised and left unpunished. “If there will be no concrete action/investigation/outcome out of this then the message will be loud and clear: You are free to intimidate them, and journalists should shut up,” Kajan said.